Archeology enthusiasts are certain to be in their element in Belize. Among interior Belize sites is Lamanai, which can be reached by boat, with the river journey working its way through forest that’s home to the likes of howler monkeys, so named because of their remarkably loud calls. Journeys to Lamanai are an “amazing experience,” Gilharry continued. The site of Caracol in turn is home to the tallest structure in Belize, she said. Those visiting Mayan families can learn the likes of making chocolate or basket weaving, with available visits ranging from half a day to several days. But Gilharry added that archeology is only one side to her homeland, with the country’s Baboon Sanctuary not having any of those African primates, but does have monkeys. Belize has also created a sanctuary specifically to protect jaguars, with those large cats having seen much of their original range in the Americas greatly reduced. The Belize jaguar sanctuary is the only jaguar sanctuary in the world. Huge but harmless whale sharks gather off of part of Belize’s coast, at times arriving as early as March and staying there into summer. 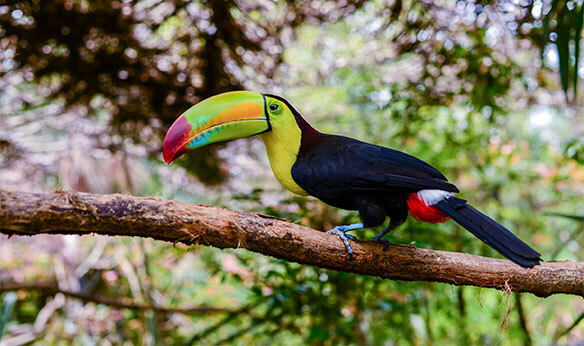 Indeed, more than half of Belize is protected by national parks and reserves, Gilharry reported. The tourism-oriented island of Ambergris Caye, known for its relaxed lifestyle, reportedly inspired the Madonna song La Isla Bonita. Belize’s watery side is underscored by the lengthy coral reef found off its shores, and Belizean ocean waters are also home to atolls. A Belize Specialist Program provides agents with the likes of priority when it comes to fam trips. Meanwhile, Gilharry welcomed WestJet’s decision to link Belize City with both Toronto and Calgary.